Winter squashes have it hard. No really, they do. But only on the outside. I know some folks choose to struggle to saw through the shell with their sharpest kitchen knife or workshop tool.Others flirt with the produce man at the grocery to get him to slice one. 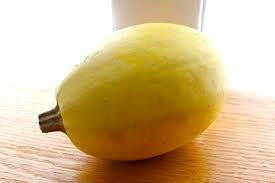 While still others, may microwave the squash for a few minutes to be able to cut through the tough exterior. In the mood for pasta? Of course you are! I am too, but I am trying to make sure I eat healthfully since New Year’s is just a few paces behind us and I can still see it glaring at me and my resolutions when I glance over my shoulder. 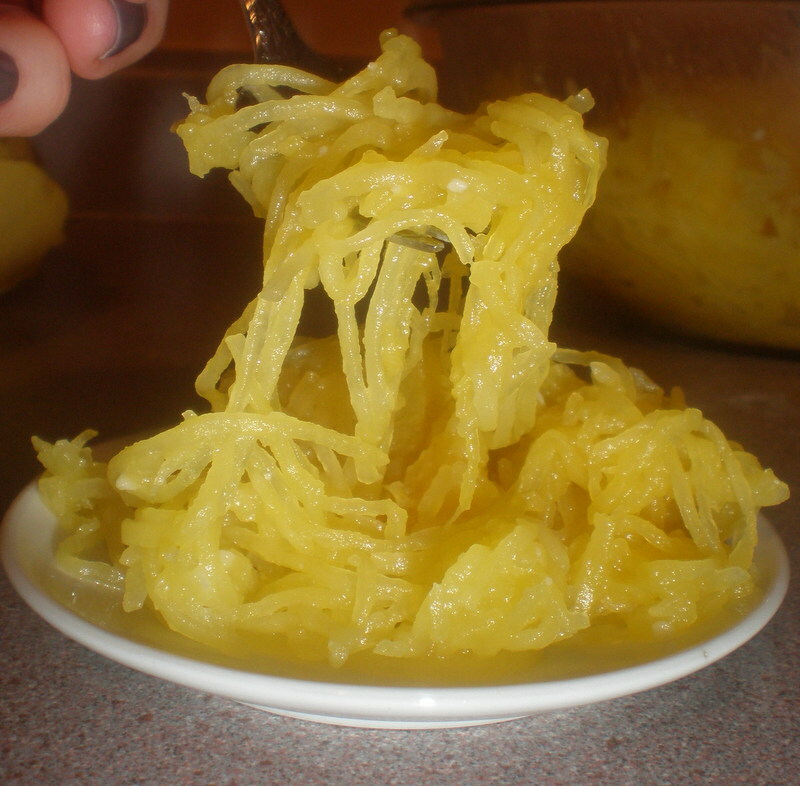 So spaghetti squash will stand in for noodles, this strange pale-yellow orb, uncanny in its ability to almost trick the eater with its ribbon like strands and its talent for holding on to butter and parm even better than actual spaghetti. It has an added benefit of having a high amount of beta carotene which will be better absorbed by your body if you have a little fat to help it along. No,by fat I mean the butter you will put on the squash, silly, I was not implying that you, my beloved reader has any fat at all. Take a long narrow sharp pointy knife and make 5 deep slits all around the squash, making sure that your knife plunges down to the center of the squash. Cue theme from Psycho now. If you have trouble getting the knife back out, envision yourself as a young King Arthur pulling Excalibur from the stone. Awesome, you are now king of the realm. 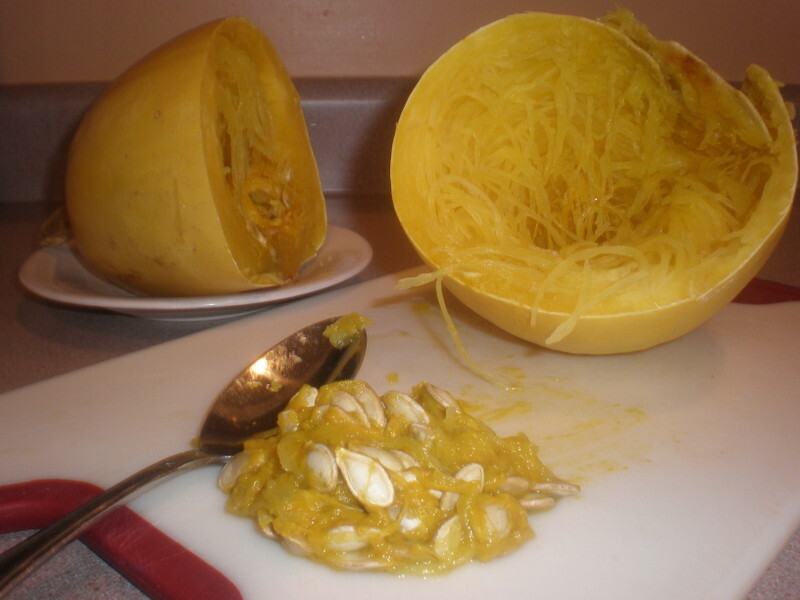 If you don’t pierce the squash down to the center, it will explode in the microwave and crack in half like an egg. I know this because some of my friends have told me it is so (Right, V. P. & E.P.?). Don’t say you weren’t warned. Put it on a plate and put it in the microwave for 20 minutes. Take it out and let it cool until you can handle it without burning your hands. Cut it in half, scoop out the seeds and discard them. 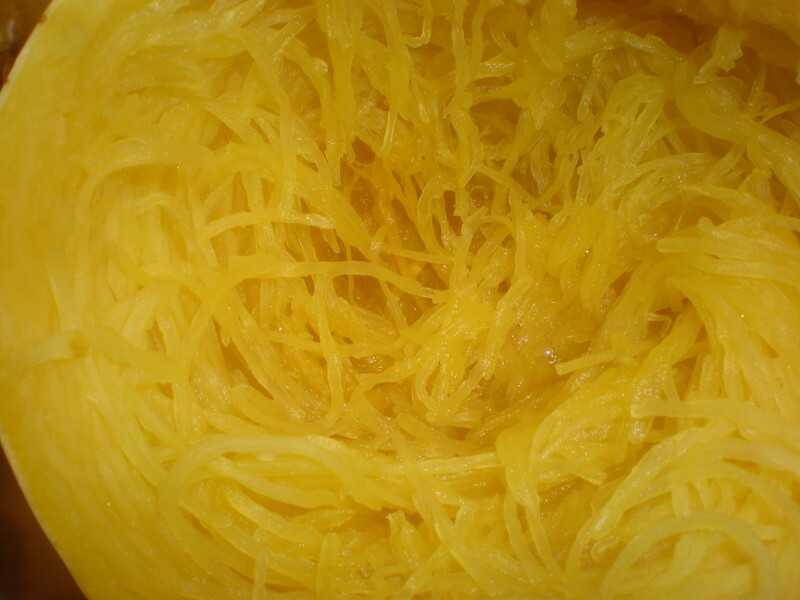 Then using a fork, scrape out the strands of squash that look eerily like spaghetti and place them in a bowl. 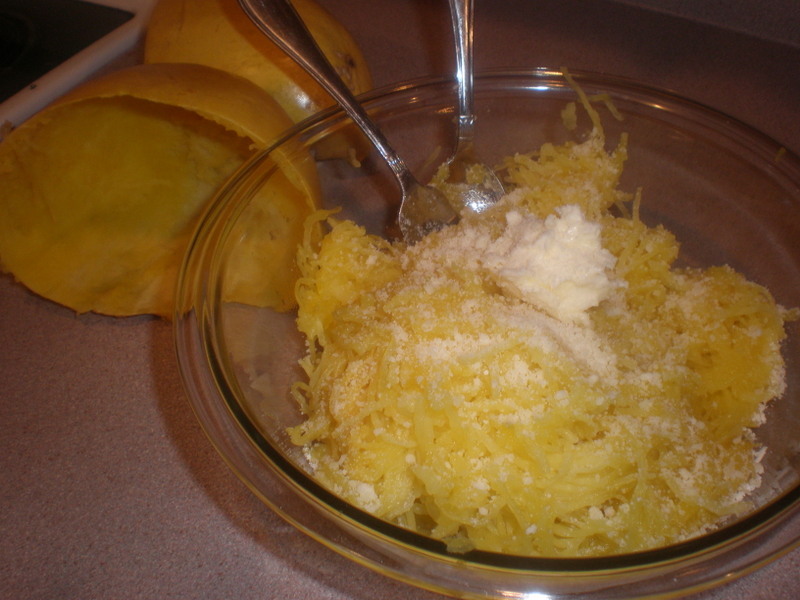 Toss with a couple of tablespoons butter, a couple of pinches of kosher salt, and a few spoonfuls of grated parm. You are almost fooled! And no power tools required! Pierce the squash with a long narrow knife 5 times around, making sure to plunge the knife deep into the middle. 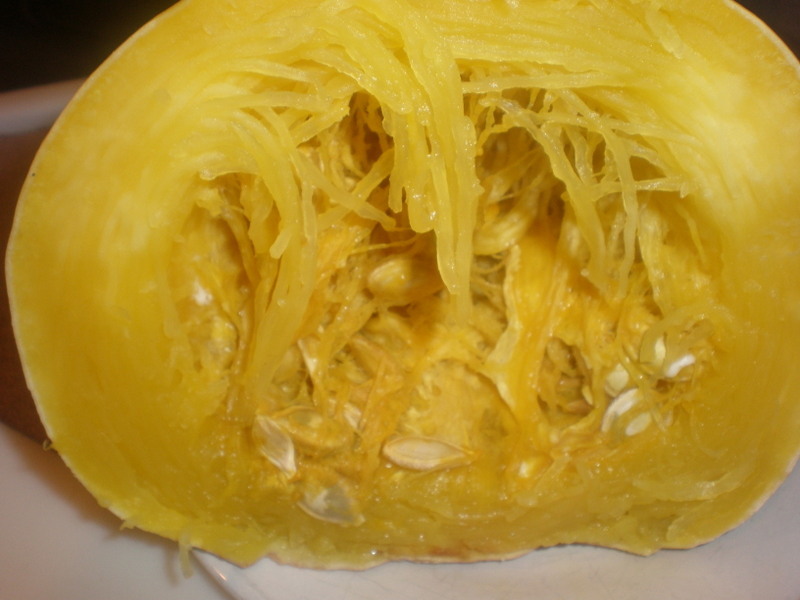 Cut in half, discard the seeds, scrape out the strands of squash into a bowl using a fork. Top with butter, parm and salt. 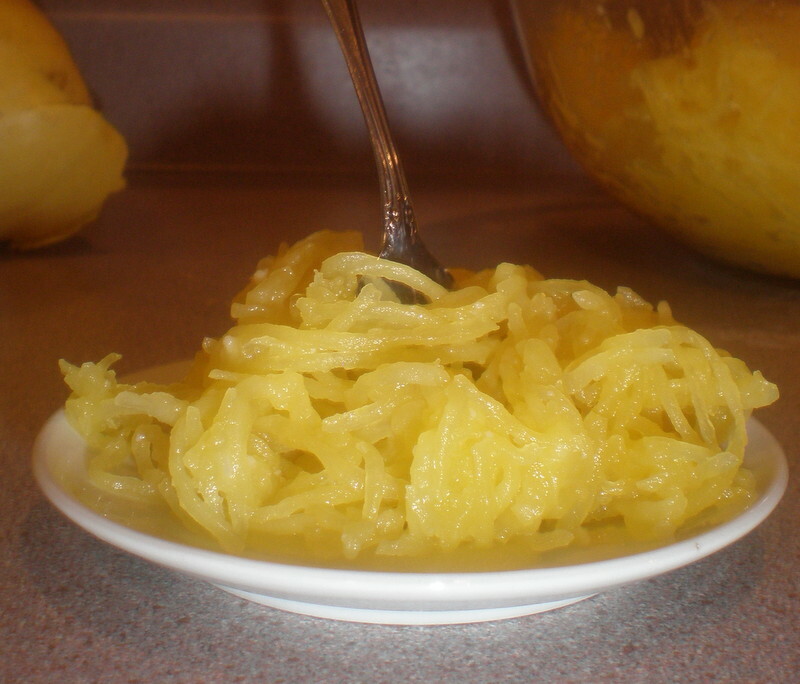 This entry was posted in Salads & Sides and tagged Butter, Low-carb pasta, Microwave Cooking, Parmesan Cheese, Spaghetti squash, vegetables, vegetarian, Veggies, Winter squash by pomegranatesandhoney. Bookmark the permalink. Yum! 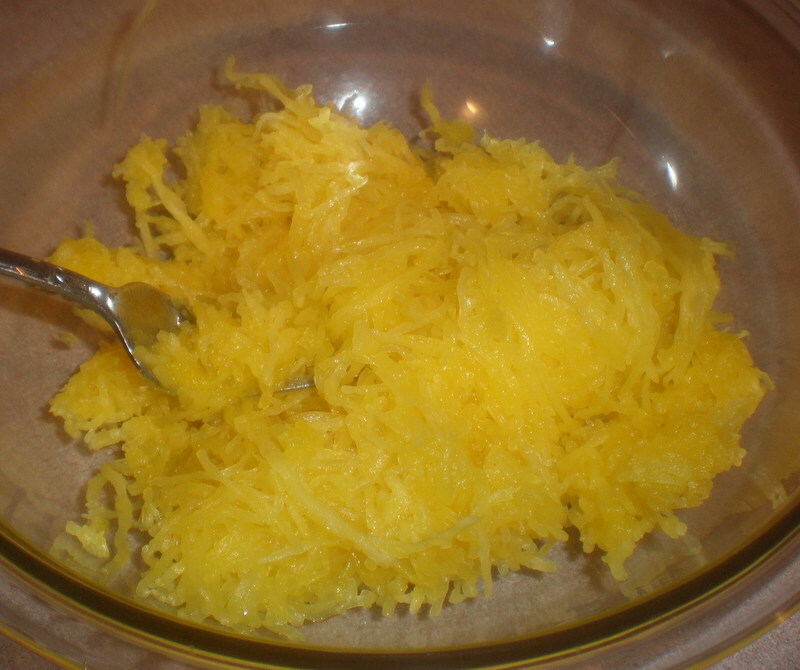 This was such a good and easy way to use spaghetti squash. I don’t think I made my piercings quite deep enough and it did ooze in a weird but sort of cool way but still turned out perfectly! Thanks Aura! So glad you liked it Sara! At least it didn’t explode! We also love it exactly like this, but sometimes trading the butter for olive oil. This looks so yummy (and healthy!) I’m going to give it a try this week. Thanks Aura! Thanks Marianne! You will love it!